The Santa Cruz Church is an interesting Catholic church right at the banks of the Chao Phraya River. The Santa Cruz Church is an interesting Catholic church right at the banks of the Chao Phraya River. After the fall of Ayutthaya by a Burmese invasion, King Taksin commanded that the peoples who escaped had to settle down in Thonburi, the new capital of Siam. 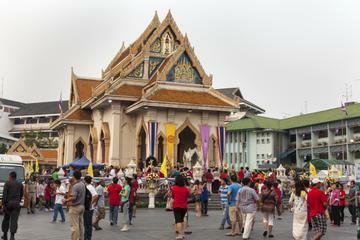 The King dictated that the Chinese group had to settle down around the area of Wat Kalayanamit, while the Portuguese people would have their houses built along the bank of the Chao Phraya River. The Portuguese had given military support to King Taksin to help him drive out the Burmese from Siam. In recognition of their support, King Taksin granted the Portuguese a plot of land for the building of a church. The first Santa Cruz Church was a wooden church built in 1770. When that church got into a state of decay, a new Chinese-style church was built here, as it was nearby the Chinese community that stayed at Wat Kalayanamit. That church was called 'Kudichin church' (Chinese church), and the Portuguese who settled here were called 'Farang Kudichin', which means 'Westerners at the Chinese shrine'. In 1916, the third and current Santa Cruz Church was built during the reign of King Rama IV. 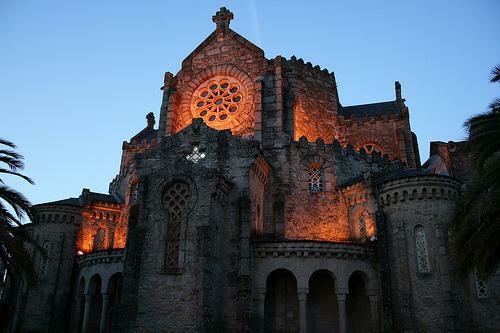 The church has a magnificent Italian-style architecture. The community around it still feels authentic, and is the birthplace of a famous kind of cupcake, the 'Khanom Farang Kudichin'.